70's pro vert skater Cindy Whitehead merging her love of Fashion x Skate a few years later. Film by Ian Logan. A "It's Not About Pretty" Production. isTia.Tv: You already have several websites, why creating a new one? Cindy Whitehead: I feel that all the blogs for girls are very pretty everything is so clean and nice, nothing gritty There are no girl’s blog that are gritty or edgy so I wanted to do something that was very different . "Remember back when I was on Blogger and they “censored” me?" 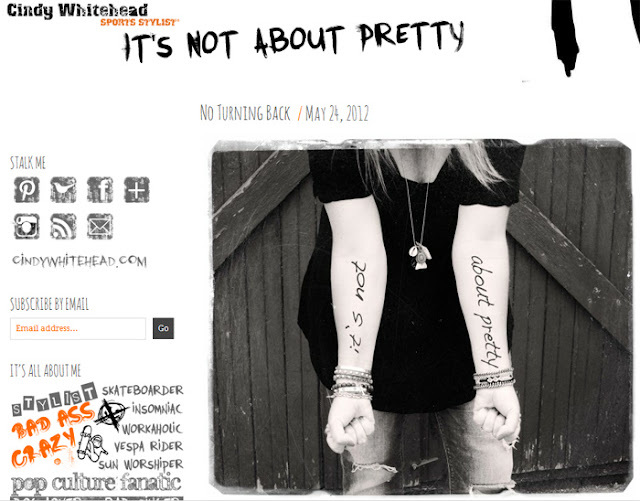 The blog that I had was very clean and pretty and I wanted to do a blog that’s more me. So, we’re gonna shut down the old blog, and we are just gonna have the new blog. collaborate and make the design really what I wanted. isTia.Tv: Who helped you to design the new site? Cindy Whitehead: I came to Judy Oyama which is a pro skater girl from the seventies. She designs for Santa Cruz and she is doing a lot of design around skateboarding. She has a company called Maximum Impact Design. I came to her and asked her: “Do you want to work with me?” and she was totally into it! She helped design a lot of things that you see on the blog and then, Ian Logan, my husband, did all the photography . I told him what I wanted on each page, how I wanted it to look. And finally, a woman named Carrie Loves, she has a business called Sweet Faerie Designs in Carolina. She specializes in doing Wordpress and Blogger sites, she worked with Judy and I doing all the crazy coding and also created a the blog elements you see embedded in various places. Between Carrie, Judy and Ian, they put the whole thing together. .
isTia.Tv: How is the new blog different? Cindy Whitehead: The blogs that you see all there are much the same, so when people look at this blog and they go to each page, not just the front page where you have all the posts, the About me page, the Stalk page, everything that we have embedded I think they’ll find it very very different. Some people will love it and some other people will find it very offensive and some other people will hate it. It’s not for everybody. It’s not gonna appeal to every person out there. It’s gonna be only certain type of people that are gonna like it and that’s OK.
Judy designed the front page for me and there is a big curse word. I was like, yeah, yeah, yeah, that’s awesome and now that I have worked on it for two months, and see it every day while working on it, I started getting very nervous that I’m putting this out and I really thank Judy and Carrie and Ian for telling me this is awesome. Just Do It! Don’t second guess yourself, or worry about what people will think, just do what you wanna do. There are a lot of people who are religious and who don’t like profanity but it’s out there every day. Judy designed it to catch your eyes and I think she really did a very good job because she captured my personality. It’s an awesome collaboration, she is amazing.